Thermal automotive Mini-CBE 1620-... Description Single pole, thermal miniaturised circuit breaker designed for automotive applications. Fits into fuse blocks designed to ISO 8820-3, Type F. Automatic reset (for DC 12 V only) and open circuit (modified reset to SAE) version optional. Open circuit version ensures contacts staying open as long as power is on. The circuit breaker will reset after the load is removed. Particularly suitable for installation in inaccessible locations. Current ratings correspond to those of blade fuses. Clear colour coding of the ratings: blade fuse and circuit breaker of the same colour have the same rating. Typical applications Technical data Protection of electrical systems of passenger cars, trucks, buses, watercraft, extra low voltage wiring systems. Ordering information Type No. 1620 single pole thermal Mini-CBE with standard characteristic curve Version, according to SAE J553 1 1, DC 12 V automatic reset type 2 2, DC 12 V modified reset type 3 3, DC 24 V with reset button type 3H 3*, DC 24 V with reset button and manual release facility type Current ratings 5 7.5 10 15 20 25 30 A 1620 - 1 - 10 A ordering example Current ratings, typical voltage drop values and colour coding Current rating (A) light brown light green Voltage rating Max. 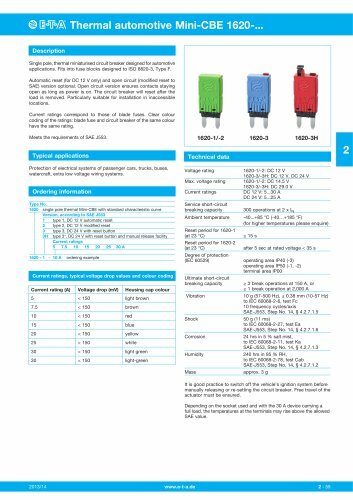 voltage rating Current ratings Service short-circuit breaking capacity Ambient temperature Reset period for 1620-1 (at 23 °C) Reset period for 1620-2 (at 23 °C) Degree of protection (IEC 60529) Ultimate short-circuit breaking capacity Vibration Shock Corrosion Humidity Mass -40...+85 °C (-40…+185 °F) (for higher temperatures please enquire) ≤ 15 s after 5 sec at rated voltage < 35 s operating area IP40 (-3) operating area IP50 (-1, -2) terminal area IP00 ≥ 3 break operations at 150 A, or ≥ 1 break operation at 2,000 A 10 g (57-500 Hz), ± 0.38 mm (10-57 Hz) to IEC 60068-2-6, test Fc 10 frequency cycles/axis SAE-J553, Step No. 14, § 4.2.7.1.5 50 g (11 ms) to IEC 60068-2-27, test Ea SAE-J553, Step No. 14, § 4.2.7.1.6 24 hrs in 5 % salt mist, to IEC 60068-2-11, test Ka SAE-J553, Step No. 14, § 4.2.7.1.3 240 hrs in 95 % RH, to IEC 60068-2-78, test Cab SAE-J553, Step No. 14, § 4.2.7.1.2 approx. 3 g It is good practice to switch off the vehicle’s ignition system before manually releasing or re-setting the circuit breaker. Free travel of the actuator must be ensured. Depending on the socket used and with the 30 A device carrying a full load, the temperatures at the terminals may rise above the allowed SAE value.